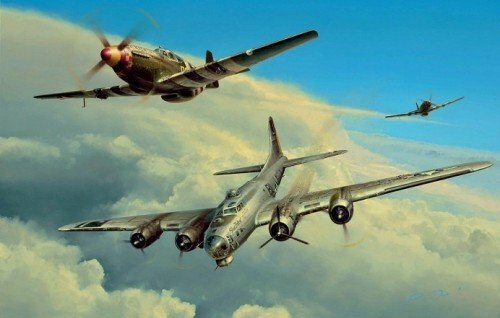 Like many other missions they had undertaken in the summer of 1944, this one had been particularly cold, tough and dangerous for pilot Harry Seip and the crew of B17G Silver Meteor. The First Lieutenant and his men had set out on that morning, 11 July 1944, from a peaceful Framlingham, on another arduous mission to Munich. With their bomb load dropped the crew headed for home, but the battle-scarred Fortress had been hit more than once, leaving the inner port engine shot out and Silver Meteor had steadily dropped behind the fast-disappearing bomber stream. Things were not looking good for Harry and his crew as the Luftwaffe fighters circled like sharks, closing in for an easy kill. Luckily the enemy pilots were not the only ones that had spotted the ailing Fortress. The P-51s of two of the best Aces in the Eighth Air Force - 'Bud' Anderson and 'Kit' Carson - had also seen the danger and came tearing out of the blue sky into the action. Within minutes the German pilots had fled and the crew of Silver Meteor could breathe a sigh of relief. With these two legendary Aces guiding them home, Harry and his men would survive to fight another day. The limited edition from Richard Taylor portraying a remarkable true event. Harry Seip is now the last surviving member of the crew of, Silver Meteor. This remarkable event has lived vividly in his memory since the War and he has always been thankful to Bud Anderson for saving his life and those of his men. Unfortunately, these two outstanding heroes have never been able to meet, but thanks to this new edition both can finally come together to add authenticity to this remarkable story by personally signing this poignant edition. THE LIMITED EDITION Along with artist Richard Taylor every print in each edition is personally signed by the principal veterans in this moving story, we are honoured that both surviving pilots have authenticated each copy with their autograph. THE FIGHTER ACES, TRIBUTE AND REMARQUE EDITIONS The Fighter Aces, Tribute and Remarqued Editions are personally signed by a further five American Aces that flew the P-51 in the European Theatre, creating an outstanding SEVEN signature collectors edition. THE P-51 TRIBUTE EDITION This THIRTEEN signature edition is issued with a unique and highly prized ORIGINAL pencil drawing by Richard Taylor, which is personally hand-signed by one of WWII’s foremost fighter leaders, DON BLAKESLEE. Each drawing is conservation matted to include Museum quality reproduction US pilots wings and the original pencil signatures of a further five prominent Aces that flew P-51s in the European Theatre – including the third member of this remarkable story, ‘Kit’ Carson. The signatories in this outstanding edition amassed a staggering total of almost 160 victories between them.